I write today's post with an immense amount of excitement at the launch of the CND Gilded Dreams Collection at Olympia Beauty on the 21st & 22nd September 2014. CND have had this glimpse on their website for a little while now and it's totally making me fall in love! To quote them they say that this collection is this season's trends adorned with sparkle and shine. I'm delighted to say that thanks to Creative Academy+ Manchester, I am getting a preview of the collection prior to the Olympia Beauty launch (Creative Academy+ Manchester will have them available for sale as of 9am Tuesday 23rd September) so I will be able to film and upload my usual comparison video in time for the launch day! Please make sure you follow my Facebook page to be notified when it's uploaded! 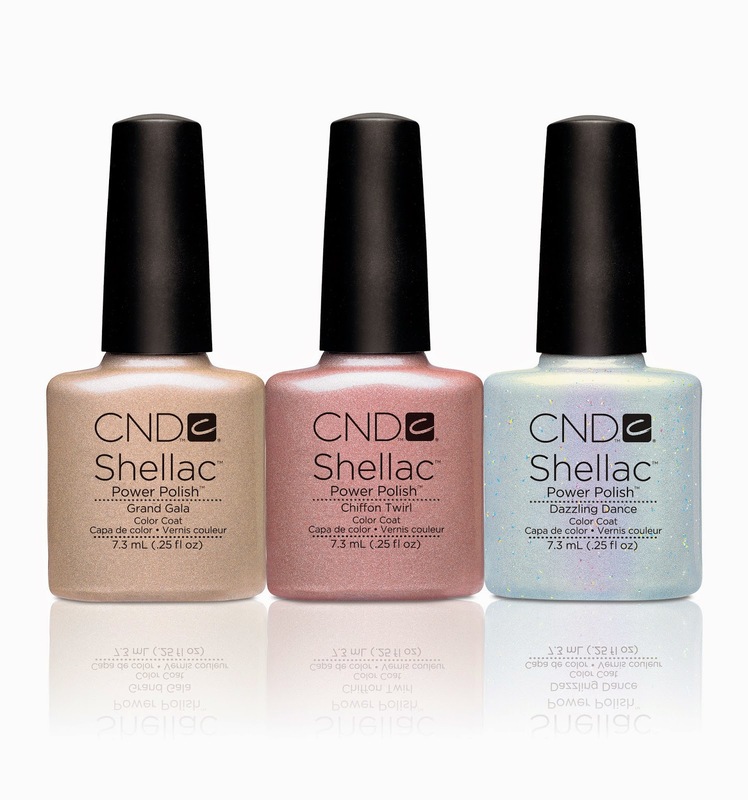 To me, the CND Gilded Dreams collection is taking luxury pastel tones that are definitely worthy of a Disney princess and making them appropriate for the cooler months. I swear to you that there looks to be some sort of magic encorporated into these limited editions shades. I was going to say that you can 'choose' from three duos but lets be honest, we will probably all end up with all three (who can resist them?!) Each duo contains one of the limited shades - Grand Gala, Chiffon Twirl and Dazzing Dance in CND Shellac and then it's matching shade in CND Vinylux. 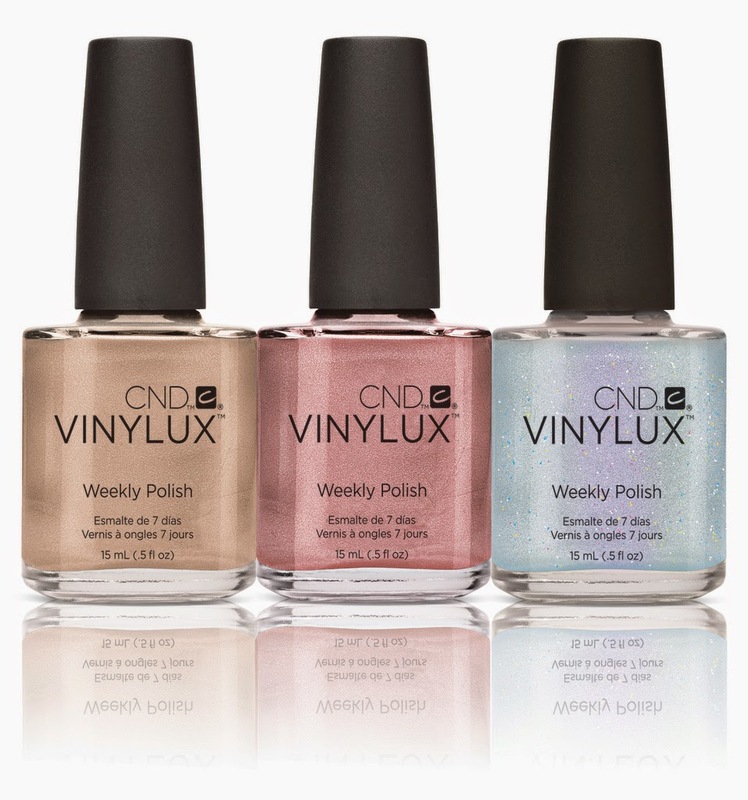 For the first time, Sweet Squared are also going to be launching CND Vinylux retail packs which will include twelve Vinylux Colour Coats (two of each shade) and four Vinylux Top Coats or CND SolarOil. The racks will be available as part of the Olympia Beauty Buy-In Deal. 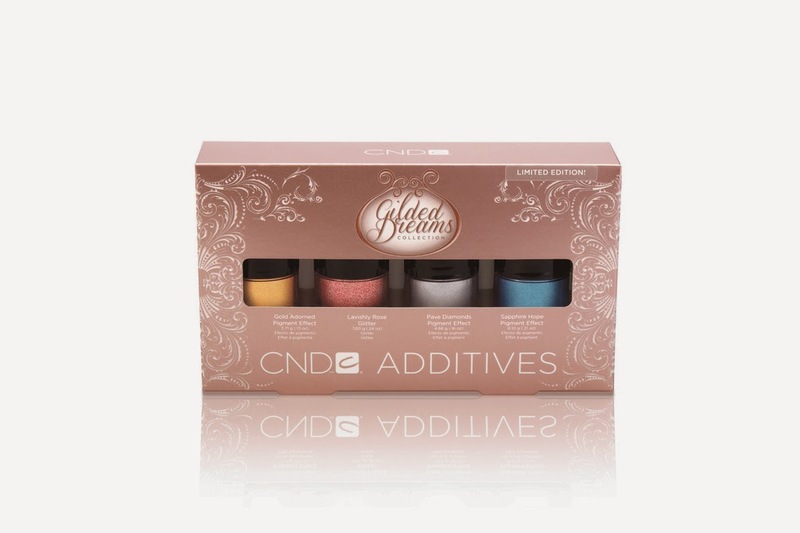 There are also four limited edition CND Additives for the Gilded Dreams Collection which all look really interesting. From left to right of the above photo are Gold Adorned Pigment Effect, Lavishly Rose Glitter, Pave Diamonds Pigment Effect and Sapphire Hope Pigment Effect. Ever since doing the CND Additives Art & Style Class I have really been using my Additives so I'm excited to see what I can create with these new shades. 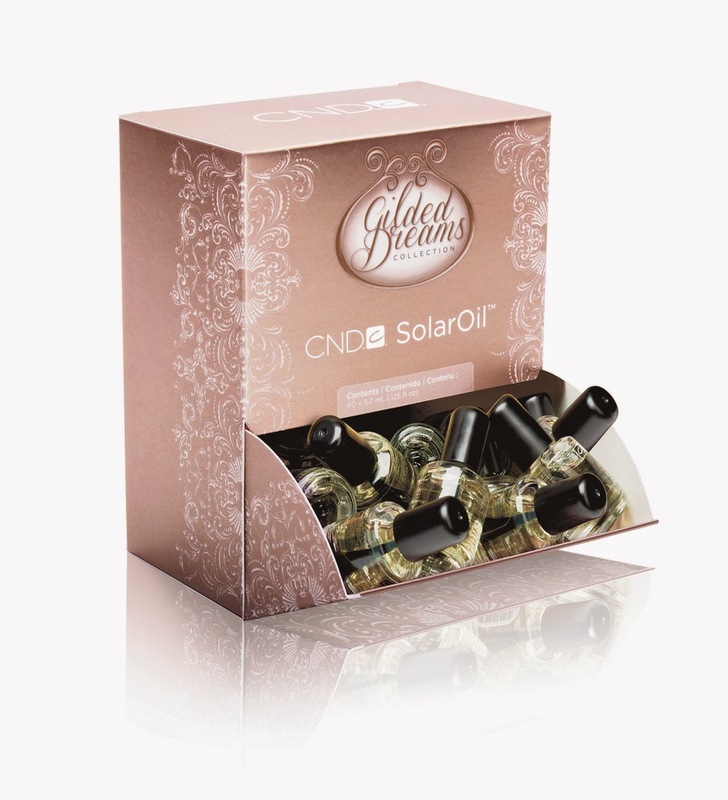 CND Gilded Dreams is finally completed with three limited edition Scentsations Gilded Blossom Lotion, Crushed Amber Lotion and Vanilla Shimmer Lotion and also Gilded Dreams CND SolarOil in limited edition packaging. For those of you who are able to attend Olympia Beauty this year you are in for a real treat (and I am extremely jealous!) Sweet Squared are once again hosting Lecente Glitters on their stand (F70) so you will be amongst the first to see their new Stardust Collection which apparently take the galaxy trend to the next level. Not only that but you will be able to meet Lecente co-founder, Maria Cientanni and watch hands on demonstrations with Education Ambassadors. If that's not exciting enough, the amazing Doug Schoon shall be on the Main Stage between 1.30 - 2.30 on both 21st and 22nd September. He will be discussing the three top challenges facing salons and spas, how to avoid common salon problems whilst keeping clients safe with healthy nails. 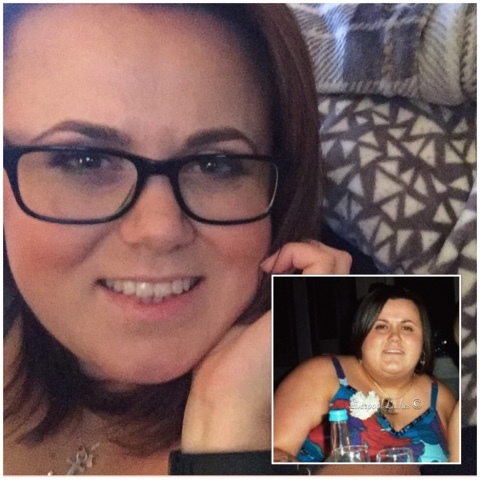 I hope that you have found this blog post useful!! Please do make sure that you follow me on Facebook for regular updates!